New research from EMBARQ can improve planners’ understanding of how to design safer intersections for pedestrians. Photo by Nicolae Duduta/EMBARQ. Pedestrians hit by vehicles when crossing on red are 56% more likely to be severely injured than those crossing on green. While crossing on red is often assumed to be mainly an issue of poor individual pedestrian behavior, recent research from EMBARQ indicates that it is also significantly related to the design of signals and intersections. Indeed, complex traffic signals with long waiting times can make it more likely for pedestrians to cross on red. In the previously mentioned study, researchers from EMBARQ collected video data of pedestrians crossing on red and developed a statistical model to predict how intersection design can impact this type of behavior. 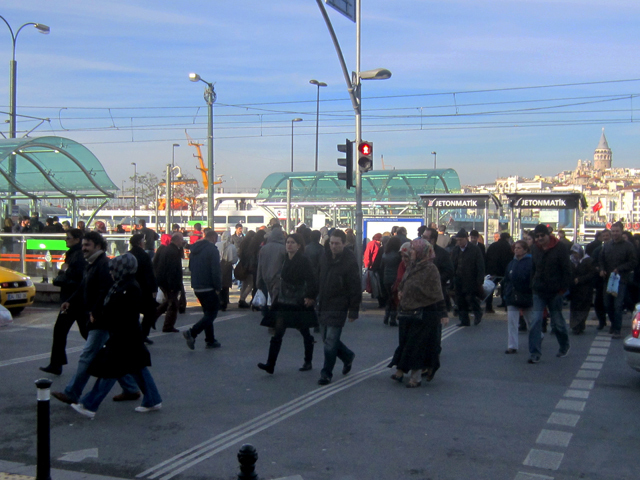 The main finding was that intersections with multiple signal phases and long waiting times are associated with a higher percentage of people crossing on red. The graphic below shows the expected percentage of pedestrians crossing on red based on pedestrian delay (average wait time) at three different intersections. Long signal delays are much more likely to cause pedestrians to cross on red, endangering their safety. Source: Traffic Safety on Bus Priority Systems, World Resources Institute report, forthcoming 2014. But beyond delay, the configuration of traffic signals also impacts pedestrians’ choices and compliance with traffic signals. Pedestrians are most likely to wait for green when the main conflict is with cross traffic. The research showed that when traffic signal configuration becomes more complex, pedestrian signal compliance decreases. Protected left turn phases, for instance, are associated with a higher incidence of pedestrians crossing on red. The physical configuration of the crosswalk also impacts the probability of crossing on red. Pedestrians are more likely to wait for green at longer crosswalks on streets with heavier traffic. It is interesting to note that while shorter crosswalks are associated with more crossing on red, research has also shown them to be safer. This illustrates the complexity of the relationship between pedestrian safety and pedestrian signal compliance: while crossing on red is generally more risky, pedestrians are also more likely to disobey the signal at locations that have more safety features, such as shorter crosswalks. Intersections in urban areas are not always designed with pedestrians’ needs in mind; instead the focus is often on moving vehicles, and as a result, pedestrians face long waiting times, and complex, difficult to understand signal configurations. While we would caution against drawing too many conclusions from a single study, there are nevertheless several design insights that can be drawn from this research. Perhaps the most important takeaway from this paper is that in order to minimize crossing on red, signal cycles should be kept as short and as simple as possible. 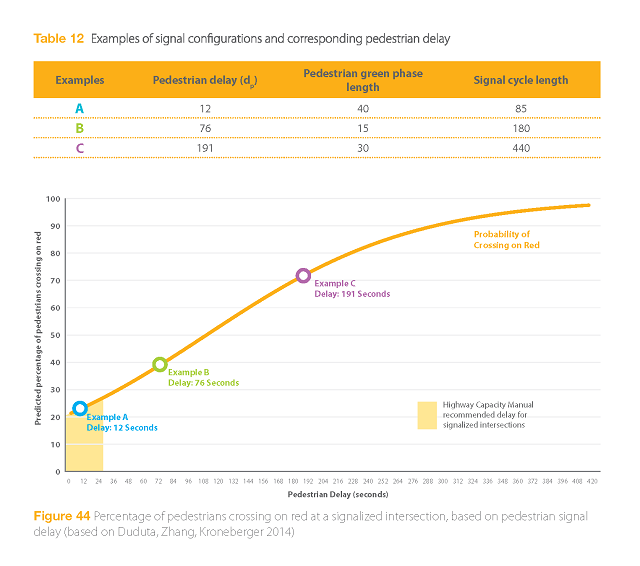 Adding phases to accommodate additional turning movements, or extending phases to increase capacity for vehicles will result in either longer pedestrian delays or more complex signal configurations. Both of these situations are likely to result in a higher percentage of pedestrians crossing on red. From a pedestrian safety and accessibility perspective, shorter crosswalks should always be preferred, since they have a better safety record, and safety is clearly a more important performance indicator for the quality of pedestrian infrastructure than the probability of crossing on red. However, designers should also be aware that narrowing a road is likely to also make pedestrians more likely to not comply with the signal, which might offset some of the safety benefits from reducing the crossing distance. A good practice from this perspective could be to couple road narrowing with additional traffic calming devices, such as speed humps.